A platoon from the 3rd Battalion Group provides security to the Dili Fire Service. Operation Astute is the Australian Government’s response to assist the Government of Timor Leste. The Joint Task Force aims to stabilise the security situation, facilitate the evacuation of Australian and other approved foreign nationals and create a secure environment for the conduct of a successful dialogue to resolve the current crisis. 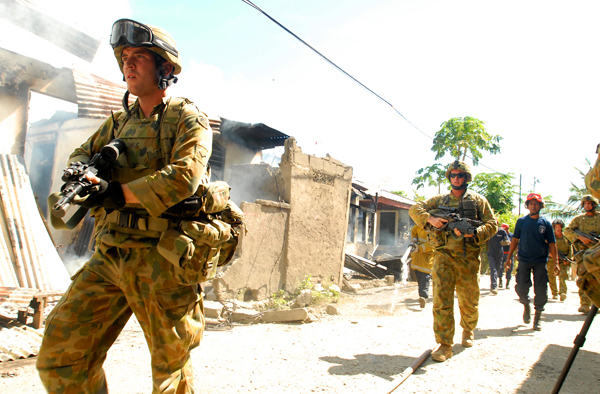 Approximately 2000 Australian Defence Force personnel are directly supporting the Australian Defence Force Response to the situation in Dili. The Operation includes components from the Royal Australian Navy, Australian Army and Royal Australian Air Force, working with other Australian Government agencies to assist the Government of Timor Leste to restore peace to the nation.